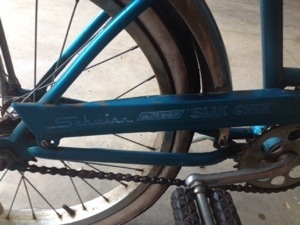 Last week I began a project restoring a 1967 Schwinn Sting-ray Slik Chik. It may seem beneath my manhood to give this kind of attention to a girl’s bike but my original plan was to part it out for quick cash. 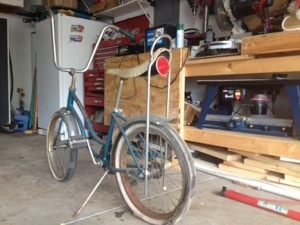 But once I saw the bike I knew I had to bring it back to life. 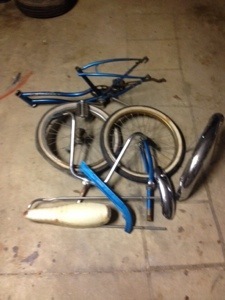 Nathan and I have been devoting an hour here and there to dismantling the bike. 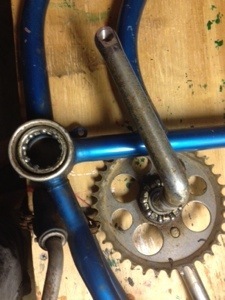 Tonight I got an hour or so in the garage after everyone was in bed and finished taking apart the pedal crank assembly. 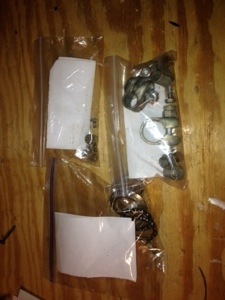 After I get the chain apart the disassembly will be finished. 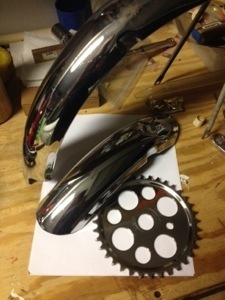 Until I buy the tool necessary for this I am beginning to clean and polish the parts as they come off. 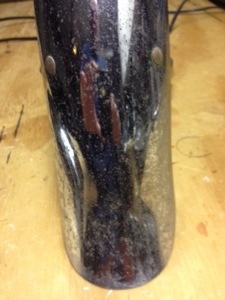 The rear fender was pretty pitted with rust but with some work and some chrome polish it is coming along nicely. 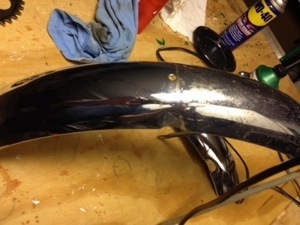 I got through about a third of the rear fender and will hopefully get to finish the rest sometime this week. 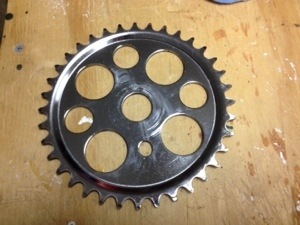 I also worked on cleaning up the sprocket. I decided to wrap tonight’s work up and go to bed after disassembling the crank and labeling the parts and after beginning the work on restoring the fenders and the sprocket. I like to surf the internet and look at things like old cars and motorcycles just for fun. Often my kids will look over my shoulder and ask, “Are you going to buy that car? !” My response is always, “No. I am just looking.” I think my attraction to this seemingly mindless activity is what I learn. Something will usually catch my eye and I will research it as if I was going to buy it, though it never happens. Well…almost never. 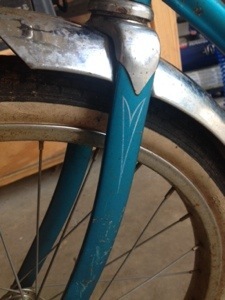 While scanning through a local online auction, I came across an old bike that I just knew I had to rescue. Funny thing is, I have heard people say that before on some of those reality shows where people buy old antiques or American memorabilia but I never understood it until now. Something about this bike was calling out to me. Maybe it was the lure of finding a treasure that was somehow lost or overlooked. Maybe it was a connection to my childhood that just felt familiar. I did some research and bought the bike with the intent of parting it out and making a profit (though a small one) from all of the pieces that could be salvaged and had value. 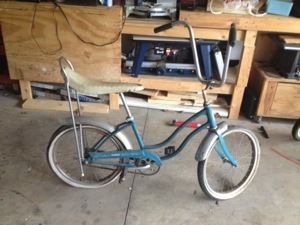 But after winning the auction and picking the bike up two days later, I knew I wanted to take a shot at restoring it even though I have never done anything like it before. All of the parts were cut and using the strap clamp we dry fitted all of the pieces together to make sure the snare mechanism worked. 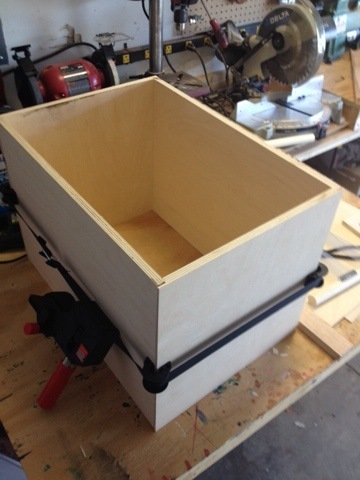 Today we glued and clamped the sides, bottom and top with the snare mechanism in place since it would be more difficult to do after it is all glued. 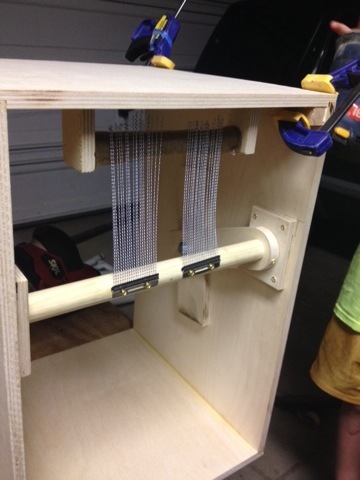 The felt bar at the top provides a place for the snare wires to rest when it is turned off. 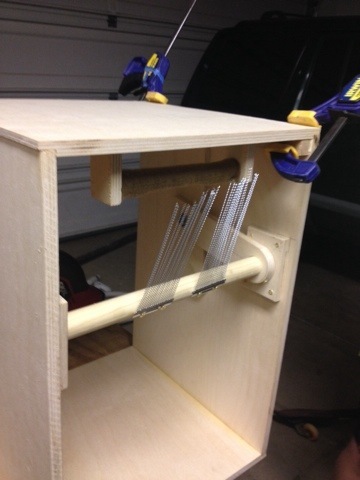 When the arm on the side is slid up, it rotates the snare wire so it is resting on the face of the cajon. This can be adjusted for the desired sound. 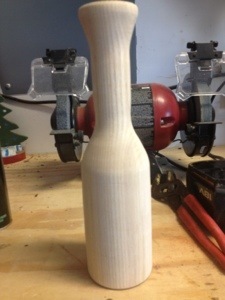 The next stage will be a lot of sanding to round the top. 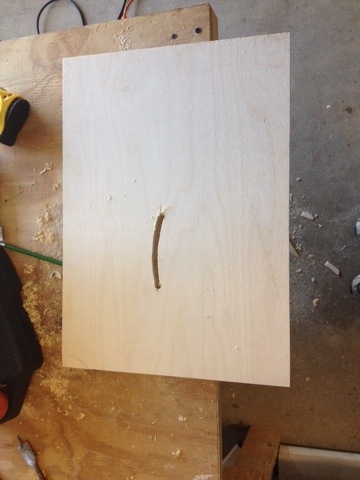 Adding the front and back after cutting the sound hole in the back side. 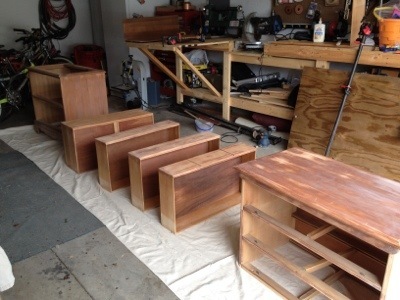 The final stage will be to stain and finish it. We have seen a cajon played several times at church but after seeing a homemade one up close we decided to take a shot at making our own. First, we did a lot of research online of different plans and features. There are many videos and blogs with step by step instructions. We also stopped at Guitar Center and looked over the ones they sell. After landing on what we felt was the best design for us, we bought materials and jumped in with both feet. One tool we bought was a strap clamp and it has proved to be valuable. The design isn’t super complicated but there are more parts to it than first appears. One feature we wanted was an adjustable snare. 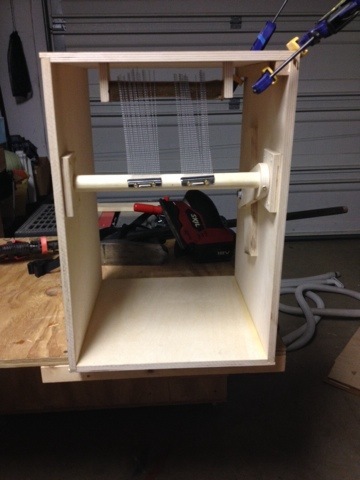 This is accomplished with a lever system that sticks out from the side of the box. 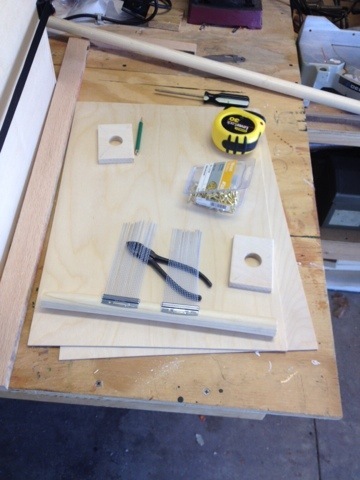 We are working to get all of the pieces made and dry fit them together before we start the construction. After that we will move to finishing it. Nathan is currently in the Teen Woodworkers class at the Greenville Woodworkers Guild. This class focuses entirely on working with hand tools. 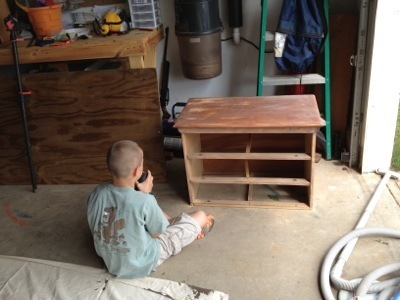 One of the first thing Nathan learned was how to make was a mortise and tenon joint using a chisel. 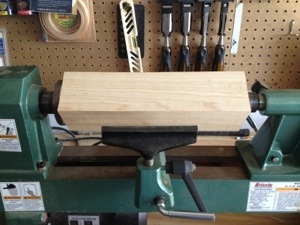 He used a gift card he won to buy a set of his own Stanley chisels but this meant he needed a mallet since you can’t use a hammer with the chisels. We bought a 3×3 piece of ash to turn his own mallet. The ash was very dry and hard and turned easily. 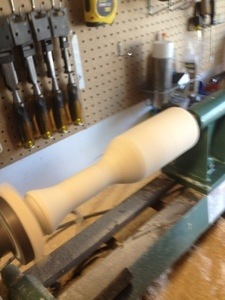 After he got the shape that he wanted, he sanded it smooth for a simple mallet ready to use. With the temperatures reaching over 100 degrees this week we haven’t had many opportunities to work on the dresser. So the project is just a bit behind schedule. This dresser will get used every day so we wanted to make sure everything was solid. 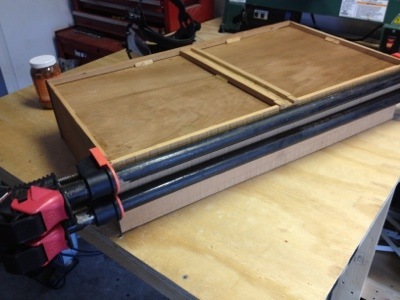 We decided to do some minor repairs on a couple of the drawers while we had it dismantled. We have primarily worked on getting everything sanded. This takes some time because there are a lot of little areas that can be hard to reach. Finally we have everything lightly sanded and laid out to paint the first coat.